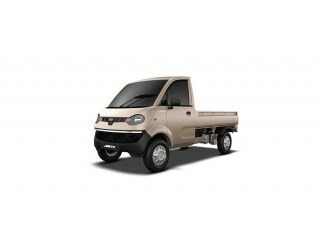 Dec 7, 2018: The Mahindra Jeeto is a mini pickup truck that is a direct competitor to the Tata Ace. It is powered by a 0.6-litre engine (625cc) that is capable of churning out a maximum power of 16 bhp at 3,600 rpm and a peak torque of 38 Nm, which comes at 1,200 rpm. This power is sent to the wheels via a 4-speed gearbox. However, despite its small stature, it is pretty healthy on its capabilities. Having a gross vehicle weight of 1,485 kilograms, the maximum payload capacity stays at 700 kilograms. It has a single cabin with a seating capacity of D+1. The suspension is done on McPherson Strut for the front and Semi-trailing arm for the rear. The stopping power is generated from disc brakes at all ends along with the addition of parking brakes. It is good looking, it is for all, for owners, for drivers. It is solid enough. It is known as commercial vehicle of the year. Mahindra Jeeto is a small LCV, and an exceptional option in its class. The mini truck is a robust model built for the commercial market. It is perfect for small businesses and gives a tough competition to the Tata Ace Series of mini trucks. It is a lite commercial truck with good mileage and power. The stylish headlamps and an attractive front grille enhances the first appeal of the vehicle. It has a single cylinder M-Dura water-cooled engine with a displacement of 625cc. It returns an amazing mileage and makes for the best choice in the commercial truck market. It meets the BS-IV norms too. The mini-truck is so popular that in August 2018, the M&M announced that it crossed the one lakh production milestone. It was first launched in 2015 and competes against the likes of the Ashok Leyland Dost and all the variants of the Tata Ace. The Mahindra Jeeto is powered by a M-Dura, 625cc, single cylinder, water-cooled engine. It churns out a maximum power of 16 bhp at 3,600 rpm and a peak torque of 38 Nm that comes at 1,200 rpm. The power is transferred to the wheels with the help of a 4-speed manual gearbox and a single plate dry clutch. The axle configuration is 4x4, which is quite amazing for such a small truck. The mini-truck isn’t very big and heavy, Hence, the small amount of power and torque turns out to be enough to drive a fully loaded truck with ease. The Mahindra Jeeto truck comes with a deck body design option. It has a comfortable and spacious cabin with decent headroom and legroom, which makes it quite easy to step in and easy to alight. The seats are very comfortable and are built for fatigue-free long journeys. The gear knob is very car-like and ranks good for more convenience. The vehicle is capable of carrying a payload of 700 kilograms. Moreover, the gross weight (inclusive of the kerb weight) is 1,485 kilograms. The Mahindra Jeeto has a tiltable steering column, which provides a very convenient driving position. The steering is a manual type unit and comes with a rack and pinion system. McPherson Strut type suspension is provided for the front, while the rear has a Semi-trailing arm unit. The suspension is finely tuned to not make the drive uncomfortable by being too hard or too soft. Being an entry-level small commercial truck, the Mahindra Jeeto has a good braking setup. There are disc brakes given for all the wheels, which offer great stopping power, especially considering that the vehicle will be used for commercial purpose where it carries load and cargo in city limits mostly. However, there is no option for ABS available with this truck, which is justifiable with the kind of power the truck has. Hence, it manages to do well without it. Parking brakes come as standard in all the variants of the truck. Inside the cabin, all the passenger seats are equipped with seatbelts for added safety. The Mahindra Jeeto has an all-new look with a stylish front grille that would please everyone. It looks quite nice with a sturdy appeal. It provides car-like comfort and best-in-class mileage of around 37 kmpl. The Jeeto is available in five different color options - Diamond White, Sunrise Red, Mango Yellow, Ultramarine Blue, and Premium Beige. Inside the cabin, the gear lever is placed right at the center of the dashboard, which enhances the interior layout and is very convenient for the drivers to use. But an option of air-conditioning should have been included for added comfort as the truck might be doing long trips as well. However, at the given price tag, the Mahindra Jeeto turns out to be a very fruitful model for the company and a great buy for the customers.